Home at last! Well, actually I've been home for five days now after a true road trip with the Amgen Tour of California. Our ten days on the route are something of a blur. Eight cities, eight hotels, and hundreds of faces and names, it’s no surprise. When I began my first-time adventure with the Advance Team/Amgen Tour of California I had no idea what to expect. Eight days and more than 1,000 driving miles later, I am a seasoned expert. Advance Team Amgen – Erin Brady and me, all two of us – were responsible for facilitating 17 racing teams of support staff: mechanics and soigneurs. Soigneurs, who are assistants responsible for various things like feeding, clothing, and escorting the riders and in French translates to "welfare man." Yes, these hardworking souls are responsible for the well-being of their riders. And they have earned all my respect...a combination Sherpa and massage therapist (in many cases), they literally carry the load.] It’s quite the entourage. At the start of each day’s race they arrive at that evening’s hotel wanting keys to their team rooms, and sheets and towels to tend to the needs of their riders when they come in from the race. There doesn’t seem to be any formula to predict how the day will go. Various levels of commotion is the best possible description. Each team has eight riders, plus mechanics, Soigneurs and managers…and possibly VIPs who can be added at any moment. The Soigneurs or possibly some other support person, is responsible for getting all the room keys and putting together a team rooming list. And this changes daily. What I learned is this: Keep smiling. Repeat the mantra “We’re working on it.” And when all else fails, shrug your shoulders and throw up your hands. And when the team staff glare at you and look marginally frustrated, don’t take it personally. They’re just doing their jobs looking out for the team. We made some wonderful new friends from all corners of the country and hope to see them again, under similar circumstances. As crazy as it was, we had a great time and rose to every challenge. For all the team staff: Jeff, Jim, Laura, Nicky, Brenda, Randy..okay, I admit I can't remember all the names, but thank you so much to everyone for your patience and understanding getting us through each day. Thank you to all the hotel staff for their help in keeping us on track. And to Amgen...hope to see you all again! There were many memorable moments along the route to Pasadena. But probably none more so than this. 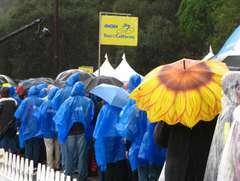 After arriving in a complete deluge, the teams pushed on to finish Stage 7 of the Tour of California at Pasadena's historic Rose Bowl. 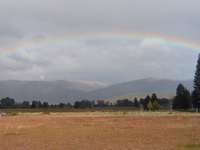 Just as the last cyclist crossed the finish line, the sun broke through and along with it...a HUGE rainbow. 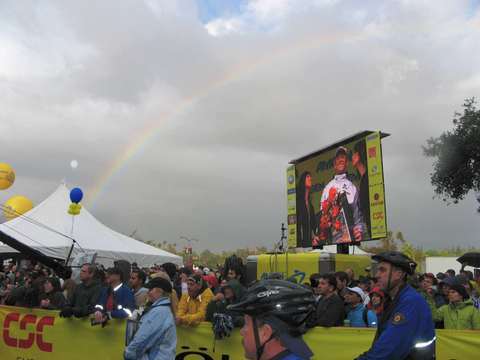 And at the rainbow's end...Stage 7 winner George Hincapie, Team High Road, finds his pot of gold. So many friendly faces and scenes along the way with the Amgen Tour of California. As part of the Amgen Advance Team, we saw little of the race as we were always one day ahead. But in Solvang we were able to enjoy some of the pre-time trial activities and the trials themselves. 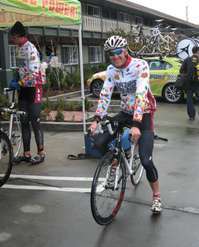 A friendly member of the Jelly Belly team, Scott Tietzel, was kind enough to stop and smile for the camera. Gotta love those beans! There was a bit of break in the weather at this stop but the storms caught up to us down the road in Pasadena. You want to talk about some rain! 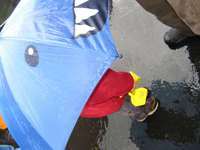 Most spectators would not relinquish their ring-side stand at the finish even in this downpour. Though wrapped in raincoat and plastic poncho, I happily stood out this drenching from the safety of the hospitality tent. The less than favorable weather did make for some colorful wardrobe displays. And even the youngest spectators in the crowd came prepared and weren't close to coming in out of the storm. 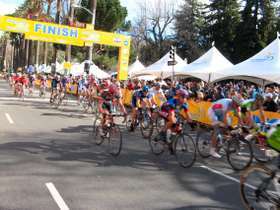 Well, the big day finally arrived and the Amgen Tour of California 2008 -- year three -- is underway. Wandering around the streets of Palo Alto, it was as if the entire city and region was under the rule of Amgen. Staff cars and IDs were everywhere. The celebrity cyclists in their colorful gear were a sight to behold. Sleek. Speedy. I'm still adjusting to the whole cycling culture. It's fantastic. Long before the actual start of today's Prologue, we were down the road to Santa Rosa, our next destination. We missed all the excitement of today's event but I can imagine the frenzy of the fans who come out in support of the race. I do miss the clanging of the cow bells. So now I am entrenched in my hotel, awaiting the arrival of tomorrow's support team - mechanics, masseuses, Soignier -- all that the cyclists need to make a smooth transition from race to relaxation. As for today, Fabian Cancellara of Team CSC (two-time World Time Trial Champion) won the 2.1-mile Prologue in a powerful 3:51:211. Team CSC will defend the leader's jersey tomorrow in Stage 1 from Sausalito to Santa Rosa. Stage 1 will cover more of California's incredible scenic highways along the coast through Bodega Bay up over heart-stopping Coleman Valley Road down into the village of Occidental and then on to Santa Rosa and three fast circuits around the downtown before a raving throng of appreciative fans. And while visitors and locals enjoy another thrilling race, we'll be on our way to Sacramento for the next day's festivities. We just returned from an overnight adventure that included spending the night in Isleton; a long-slumbering California Delta town. No Starbucks. No Jamba Juice. No Big Macs! And I would like to say, this is a very good thing! The town is funky. No question about it. But in that funk, is the beauty of it all. State Scenic Byway 160 cuts right through Isleton. And you can't hate the fact that it sits right on the Sacramento River. But then there's "downtown" Isleton. Sort of in a state of arrested decay, it never really seems to change. Ramshackle buildings (less than 5-feet apart) still have their corrugated metal shells with decades of rust. Many of the storefronts retain their historic flavor, but most were long-ago abandoned and stand empty. 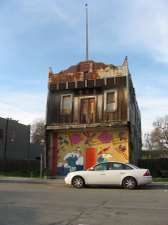 Some are in the process of being reclaimed, with colorful exteriors, new windows and doors. But Isleton is waiting to awaken. The historc Hotel Del Rio is closed. Across the road, Isleton Joe's (aka Ernie's to those who know) is still doing a bustling business serving up steaming bowls of fresh crawdads and clams, and slabs of prime rib. Down the street, Delta Daze Inn and Rogelio's Dine & Sleep Inn, are reminders of another place and time. Not your Mobil 5-star experience, but places that retain a real and human factor. We spent a comfortable night at Delta Daze Inn, fell asleep to the sound of crickets and during the night listened to the howls of far-off coyotes. The owners, Jill and Bill, are East Coast transplants who discovered the good life in Isleton and share it with their guests. More than one person told us that the Pineapple Restaurant has great Chinese food; and Muddy Waters cafe (across the street) is the local caffeine hang-out. "The old-time farmers came in and said they didn't want any of those foo-foo drinks. But within a month, they were drinking white mochas and Spiced Chai," said owner J.T. And there is a new art gallery, but on a sunny Saturday afternoon it was closed, along with many other businesses. 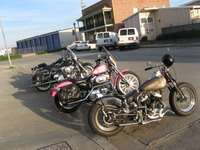 The local "biker" club was open for business and a lovely pink Harley parked curbside was a reall show-stopper. Well, at least we stopped. Amazingly though, this back-water town of less than 1,000 people is actually "world-famous" as the home of the Isleton Cajnu & Blues Festival. Not the oldest, but possibly the largest festival of its kind. Each year over the Father's Day weekend, the population of Isleton swells. They have played host to more than 100,000 people and served up more than 12 tons of those tiny crustaceans in a single weekend. Music -- jazz, Zydeco, blues. Dancing. Crafts. And food...lots of food...and plenty of crawdads. Y'all come on down! We roamed the streets quite happily. At Ernie's (sorry, it will always be this to me), we shared some pleasant conversation with a couple from the Bay Area who were relocating a sailboat from the Delta to Alameda. We laughed over a couple of baskets of homemade potato chips and onion rings. 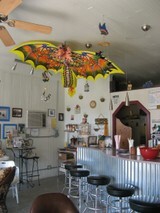 "Part of the four food groups: alcohol, caffeine, sugar, and grease," said our new friend Joan Wetherell. And our young waitress? She proudly told us she'd been born and raised in Isleton and workin' at Joe's for more than a year. It's Mayberry. It's Father Knows Best. It's life, the way it use to be. Though there's plenty of room for change, I hope it slumbers on. And I hope to tell you the "rest of the story" that included a leisurely drive on the Delta Loop and possibly the tastiest BLT I've had in a long, long time. Let me know if you're interested. Sadly, since being published, Ernie's/Isleton Joe's closed for good. We hope it will rise again to be a shining star of the Delta. 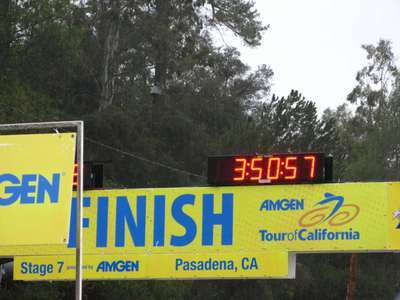 In just a few short days, the world's best cyclists will descend...or should I say, pedal their way across California during the Amgen Tour of California. The next best thing to the Tour de France...well, maybe better. After all, it is California! We may just be giving the French a run (or bike) for their money. From north to south, they will race past redwoods and vineyards, coastal highways and urban landscapes covering more than 650 miles over eight days. From Palo Alto to Pasadena, they speed by more than one million screaming fans! It's an event like no other. Come out for a day or every day. The frenzy includes a Lifestyle Festival located near the finish line at each finishing city. It's totally kewl!! Exhibits, equipment, music, cancer awareness education, cycling gear, family activities, bike safety, food, entertainment and more! So much more! 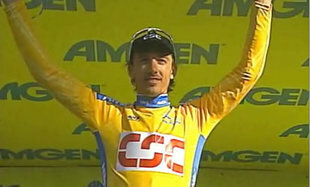 My first time with the Amgen Tour of California was year one, 2006. I participated in the Lifestyle Festival for four days in Santa Rosa, San Jose, and San Luis Obispo. It was the most exciting event I have ever experienced. The energy levels were off the chart...and that includes mine! I knew nothing about this sport then (I only know a little now) but you don't have to be an expert to share the thrill. Lucky me, I will be on the road and working hard with the Amgen Advance Team. WIsh I could say, "see you at the finish," especially in my home city of Sacramento, but I'll already be way ahead of you and the rest of the pack. However! See you, for sure, at the finish in Pasadena. Please find the Sierra Business Council article below my article about Attilio Genasci. You probably never met Attilio, but you'll wish you had! I was fortunate to meet him just once. That was enough. He left an indelible mark on me and my soul. And I am richer for it. 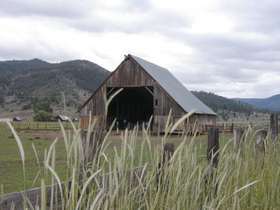 I attended the Barns, Birds, and Barbecue Festival in the Sierra Valley sevearal years ago. Part of the festival included a tour of the spectacular Genasci Ranch and barn. The highlight was meeting Attilio and listening to the story of his life and the ranch. It was magical. He stood there, at 95 years old, his features beautifully weathered by time, hard work, and his life on the land. Next to him, his young grandson stood and watched with love and admiration. It was a moment I cannot forget. It brought tears to my eyes...then, as now. After he was done speaking, I made my way to him to shake his hand and thank him. When I saw the subject line of this past email -- Attilio Genasci -- I didn't need to open it to know what it contained. I cried...but am joyful for having had one brief moment to know this California hero...this part of California's rich culture and heritage. And today and everyday, along with so many others, I celebrate the life of Attilio Genasci. The Sierra Nevada is mourning the loss this week of a true hero. Attilio Genasci was a rancher, father, grandfather and leader in his community. At 98-years-old Attilio had lived on his ranch in the Sierra Valley his entire life. To the residents of the Sierra Valley, Attilio will remain an icon, a community resource, and a community conscience. No one was better at articulating the values of the region and the value of a life that is lived close to the land. Several years ago Attilio pioneered the process of adapting conservation easements in his valley as a strategy for maintaining land in agricultural production. Attilio was a bridge between the ranching culture of the 19th century and a land health ethic of the 21st century, reminding all of us that land has always been a part of the heart and soul of our country. Attilio pioneered a new understanding of the connection between the land and the spirit of a people. This earned him a Vision 2020 Lifetime Achievement Award from the Sierra Business Council in 2004. The Sierra Business Council will miss Attilio Genasci. We loved him for all he taught us and for all that he gave during his life to the land, to his community, and to his loving and inspirational family. We share in his family's grief and also in their pride for the accomplishments of this remarkable human being. The independent media project, Saving the Sierra: Voices of Conservation in Action, produced radio profiles of Attilio Genasci over the past several years. You can listen to them and see photos of Attilio by visiting: www.SavingTheSierra.org. You can also list to Saving the Sierra's audio portrait of Attilio, "Holding His Ground," that aired on the public radio series, Stories from the Heart of the Land. "Holding His Ground" will air again in honor of Genasci during the public radio program, Weekend American, Saturday, February 9th. Please visit the Weekend America website for the exact schedule. "It's so quiet and peaceful here, and I think I want to save it for posterity. The land does not belong to me...it's there for humanity. And we dare not destroy it anymore than we'd cap the geysers at Yellowstone or put the Bridal Veil Falls at Yosemite in a pipe." Attilio Genasci. Attilio Genasci, Sierra Valley Rancher, died this week at the age of 98.